The Artesia City Council met for the last time Tuesday in its current incarnation, with the 2016 Municipal Election approaching March 1. 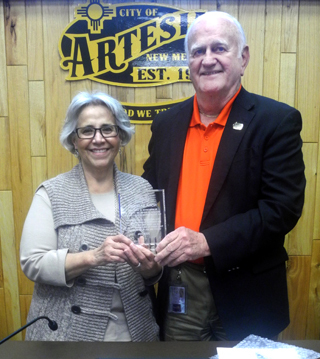 During the meeting, Mayor Phil Burch presented city councilor Nora Sanchez with a service award in honor of her contributions to the city. The meeting was Sanchez’s last, as she is not seeking reelection in next Tuesday’s election. Also during Tuesday’s meeting, Fire Chief J.D. Hummingbird presented firefighter Dakota Corbell with the 2015 Firefighter of the Year Award and Captain Erik Nunez with the 2015 Fire Officer of the Year award. “Both are outstanding individuals, and I couldn’t be prouder,” said Hummingbird. In other business, the council approved an ordinance for a zone change from SA-2 Residential District and Manufactured/Mobile Home District to a Commercial Business District at 2218 and 2302 Grand Ave., owned by Pecos Valley Regional Education in partnership with the Artesia Public Schools. The council also approved the hiring of Teresa McKenzie as a detention officer for the Artesia Police Department at a pay rate of $2,363 per month. • approved the awarding of a bid to construct AMR Phase II Replacement for the Water Department to Century Club Construction Co., LLC, of Albuquerque. • accepted the retirement of Cheryl Hinkle, code enforcement officer, effective March 1. • accepted the resignation of Abraham Turany, wastewater assistant, effective Feb. 15. • approved a facility-use request for the 7024U Outreach Center and Changing Lives Coalition for the use of the Martin Luther King Jr. Recreation Complex from 11 a.m. – 1 p.m. Friday, May 27, for the annual School’s Out Summer Splash.